Girl Scouts of the USA (GSUSA) has been preparing girls to be leaders since the organization was founded in 1912, and today Disney Channel and GSUSA announced that Disney’s newest princess—Elena of Avalor—will help inspire the next generation of girls to lead. The brave and adventurous teen, learning to rule her kingdom as its crown princess on the brand-new animated series Elena of Avalor, is the inspiration for The Elena of Avalor Leadership Guide by Girl Scouts and Disney Channel, debuting today. Available in English and Spanish, the guide showcases leadership activities and conversations parents and caregivers can engage their preschool through fifth-grade girls in to boost their everyday leadership skills and prepare them to create the future they imagine. The partnership with GSUSA is a perfect match, Ariyasu explains, pairing the series’ curriculum—which supports the princess’ innate strengths—with GSUSA’s expertise and philosophy surrounding character development. “The values and leadership strengths that both the series and GSUSA were committed to highlighting came together seamlessly,” she says. “As we launch Elena of Avalor on Disney Channel, nothing is more important to us than using the impact that we know television has on our audience to showcase strong, ambitious role models for young girls. Our work with GSUSA will give us the chance to amplify that message and be a part of the largest community of young female leaders, by providing materials and inspiration that demonstrate every girl has the power to lead,” Disney Junior Worldwide’s Executive Vice President, Original Programming, and General Manager Nancy Kanter said. 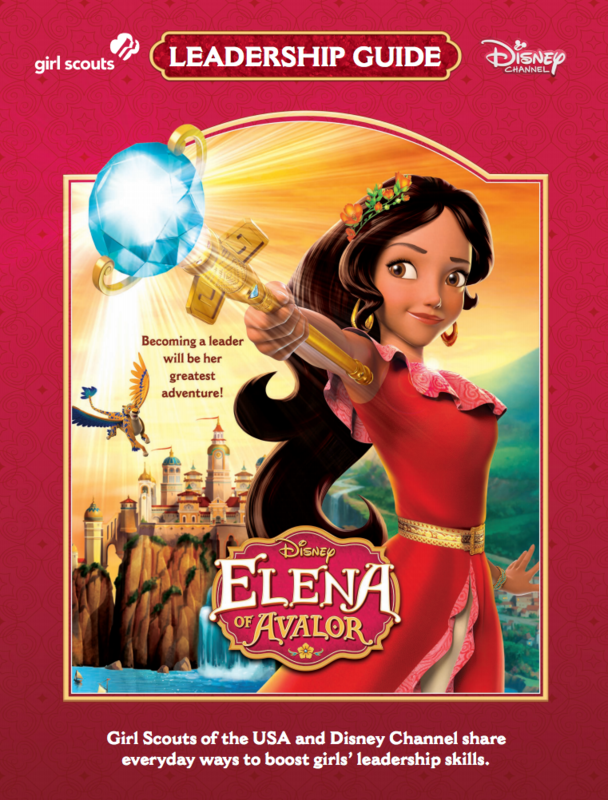 The Elena of Avalor Leadership Guide will be followed by the inaugural “Elena of Avalor—Scepter of Light Award,” which will honor two Girl Scout Gold Award recipients for demonstrating extraordinary leadership and exemplifying compassion, critical thinking, collaboration and courage—as modeled by Elena of Avalor. The honorees will take part in events that include Elena’s Royal Welcome at Walt Disney World in Orlando later this month and a GSUSA event in Chicago in the fall. Later in 2016, as part of Disney ABC Television Group’s Be Inspired pro-social efforts, Disney Channel and Disney Junior will also air leadership-themed interstitials that feature Girl Scouts alongside Princess Elena, which will kick off a user-generated contest that encourages girls to share how they exemplify being a “G.I.R.L.” (Go-getter, Innovator, Risk-taker, Leader) on International Day of the Girl (October 11).